Okay, yesterday began what we traditionally refer to as "The Dark Time." Yes, that would be the day after baseball season ends. But you may ask, "Diana, why is this Dark Time different from all other Dark Times?" And I would answer, "Because the Philadelphia Phillies are the WORLD CHAMPIONS, and so the rosy glow emanating from their win will light up the Dark Time until February when pitchers and catchers report and the so-called "Dark Time" will end." Amen. A word of advice: If your local sports franchise wins a championship, RUN don't walk to your nearest automobile and jump in and drive around and honk the horn. Gus and I drove around Glenside after the Phillies won, and I must say that driving around and honking the horn at everyone I saw was possibly the most fun thing I've ever done. In 1980, my next-door neighbor Mike O'Neill and I drove around Jenkintown, but Mike was driving and honking the horn so I didn't quite grasp how insanely fun it is. Now I shall ease into the rest of my non-baseball-related life. You may recall that yesterday was Halloween. 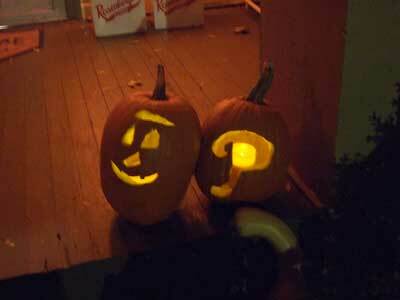 For Phillies fans this came as quite a surprise, though I did make a statement with the old jack o'lantern. As far as costumes went, thank god for my low-maintenance boy. 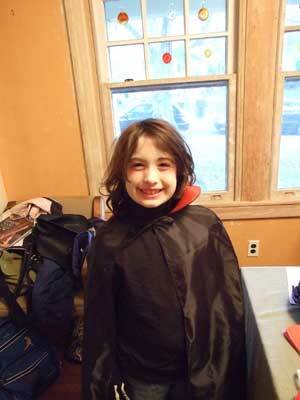 This year, instead of the obscure Cartoon Network cartoon character he usually favors, he decided to be a vampire. And not a complicated, Count Dracula-type vampire. "Just a regular vampire," he declared. 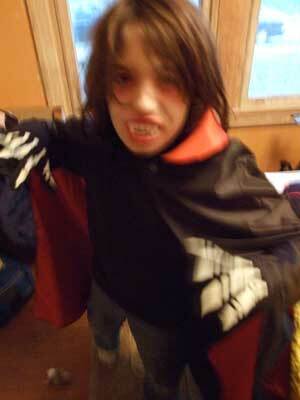 So that involved buying a $4.99 cape from Kmart and some $1.99 vampire makeup. We were shut out of parade festivities yesterday thanks to SEPTA. But we are still walking on air here over the win. My son was Chase F. Utley for Halloween yesterday, and everyone shook his hand and congratulated him as he trick-or-treated. The middle of the pumpkin is stuck in there with a toothpick, BTW. I tried to get Gus to go as a "Phillies Vampire" (which would have entailed wearing a phillies t-shirt and hat), but he nixed that. I guess it wasn't "regular" enough for him. You guys should have come down to Keswick and Easton, that place was a blast. I braved a stomach flu for the opportunity to high-five strangers and beat on a saucepan. That was a truly marvelous day in the life of Philadelphia - Charlie Manuel, Mike Nutter, Chase Utley, Harry Kalas, and all. (Funny; I didn't see Adam Eaton.) A great day for Philadelphians. And on Halloween, too. We had some kids come to our door last night at about 8:30, saying they had JUST gotten back from the parade downtown. My brother (not a baseball fan by any means; I had to explain to him what was going on during the Series) lives on 20th Street just above the Free Library. He thought he'd go out and do some shopping yesterday. Ha! He said he was barely able to get back home! Whoopee! Bring on the Dark Times. That is the MOST handsome vampire EVER! And the pumpkins look great too! OhMyGawd, was that a fabulous World Series or what?! At times I was so nervous that I could not watch the TV. My hands have been rung, my nails bitten, my tears cried. I am convinced that all of those behaviors must have helped for they are the World F'in Champions for goodness sakes!